Have always loved Henckels knives. Was so glad to be able to finally get some. Prep work is easy with the Henckels International CLASSIC 7-pc Knife Block Set. Experience confidence with each cut thanks to the fine-edge precision blades that are honed for long-lasting sharpness. The 8" Chef's Knife, a kitchen workhorse, is ideal for chopping herbs and dicing onions while the 5" Serrated Utility Knife cleanly slices through tomatoes. Perfectly peel apples with the small 4" Paring Knife. High-quality German stainless steel strengthens these durable Spanish-made knives. With a seamless transition from blade to handle, the knives' fully forged construction provides balance as the traditional triple-rivet handles encourage tireless cutting. The handsome hardwood block handily keeps this useful knife collection within reach on your countertop. J A Henckels 3 in. 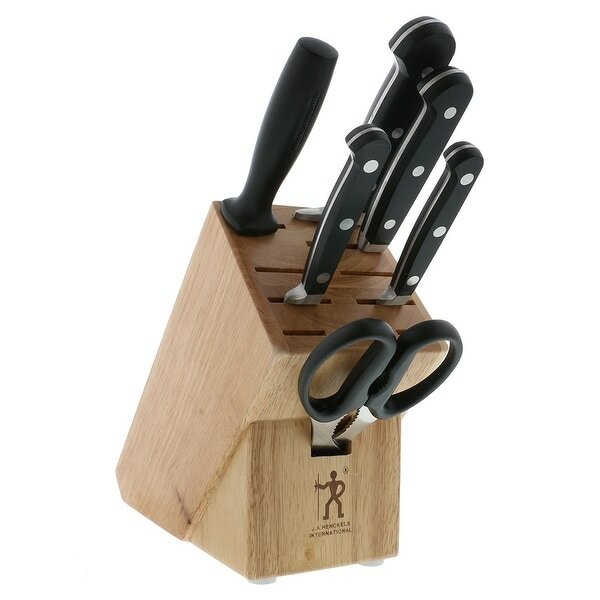 L Stainless Steel Knife Set 7 pc.